Latest algorithm update from Google impacts 90% of searches. Are you ready? We look at what you need to consider so your site content is in good shape for this new Hummingbird approach. This update has a very different complexion to its predecessors Panda and Penguin which were all about penalties for sites that fell short of their higher standards (for linking and content quality). Hummingbird is all about answering queries and not best matches for specific keywords. Unlike Panda and Penguin that can be see as extra filters to an existing algorithm Hummingbird is a a completely new package – so highly significant. Using the large amount of data from Android and Google Voice, Google now has the capacity to understand what you really want to find, even if you haven’t phrased it very well. Typically a hands-free, conversational query is longer and more likely to be less well formed and woolly. In addition to this semantic natural language processing function the Google knowledge graph will be playing a greater role. Up until the Hummingbird launch Conversational Search worked mainly in providing content from the knowledge graph now this functionality has been extended from Googles own content to now reach across the many billions of web pages it holds in its index. Google’s recent decision to make search term data 100% not provided is quickly reducing the amount of data site owners can see on what search terms were used to find their pages or site. (though it is still available in a slightly lesser format via Webmaster tools and Googles Adwords).The Hummingbird algorithm continues along that path with increasingly less emphasis on keywords and more about the intention behind it. For website owners, content creators, marketers and SEO’s there needs to be a shift from a focus on keywords to scrutiny on intent. Previously you were probably looking at what text your target audience, potential customer or site personas would be most likely to type into a Google search box and seeking to match that in your content and at the key points in your HTML. Now you need to look at the intent behind their query and use that to inform how you create posts and articles. Think about what questions your audience is asking behind a search phrase then provide answers with good quality content. Try and match a conversational phrase and you will be on target – these will often begin with “How can or does”, “Where is or can I” or “What is”. With less emphasis on specific words look to use other supporting theme-related terms. Take the time to expand your keyword research, look at co-occurring terms and synonyms. This will help diversify your content your content and be a better match for user intent. Position your site as a hub of information on a specific topic and provide a good number of informative, engaging and “shareable” articles or posts. Deliver answer on the questions that you can truly answer comprehensively, and be an authoritative voice about topics that really relate to your business, product or service. NB If you are not already doing so the best way to deliver this quality content is a blog. Once you have a pool of great content start to think about the social signals such as links, likes, shares and tweets which will offer extra validation to Google that you have a quality match for a users intent. This will involve relationship building with your audience which will take time. SEO is more than ever a marathon not a sprint. Over time if you have content that visitors like then Google will like it too. As Google aims to find content that matches user intent it will at the same time want to collect more data about your pages and website to better understand its theme, topics and subject matter. You can help this process by providing plenty of structured data. All these are fairly easy to use and just need to be pasted into your page header. 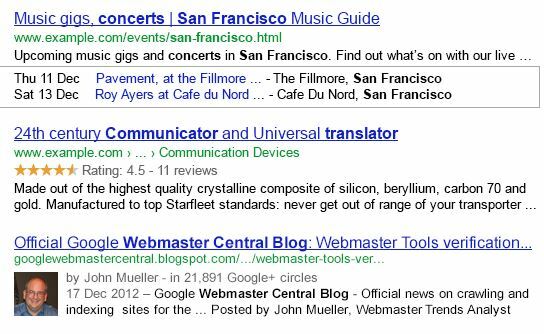 Check the help sections in webmaster tools for some good advice plus a handy Structured Data Testing Tool to see how Google will interpret your new code. Another area you should consider for your pages is Universal Search. This provides some different routes on to page one. 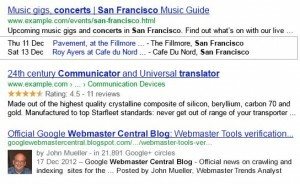 Universal search blends in some other sources into the standard search results. This includes images, video, local and map listings even news and blog items. Try this search here for “golf swing tips” see how the two videos have risen to the number one and two slots (Google recognises the intent of the search is to get a better golf swing and a video is the best answer); interestingly the number two video has been around since 2009 and has achieved nearly 4 million views! Hardworking for an 8 minute clip – could you make something as interesting for your site? If you do have video make sure the whole page is optimised on YouTube and with the right structured mark up elsewhere. If there is any location based aspect to your business make sure you have a Google+ account with all the details updated so your site will appear in local map based search results – always on page one and near the top. Google+ is also the route to connecting with your Google plus reviews and the ability to add authorship information. Both of which are very worthwhile and will offer better visibilty and in the case of reviews help move you up the results page. Make sure images are well optimised for Google so you can achieve better placing if user search has a visual element. Most of the old SEO factors (and penalties) are still in place however quality content keeps getting more important make sure your focus is on the page matching the meaning or intent of the search not pages that match a few words.